Dear Readers, it has been a difficult few weeks. Mum was in hospital until yesterday (Wednesday) but has been weeping because she wants to come home for at least a fortnight. At one point I honestly thought that Dad would ‘spring her’ from the hospital and drive her home, in spite of his dementia. Now she is home, and I am trying to make sure that we have the correct care at the correct time. My worry is that whatever we plan it still won’t be enough. Mum is intermittently confused, extremely weak, and seems to have forgotten many of the things that she was able to do just a few short months ago. Getting off the toilet is a problem, for example, not because Mum is too weak to do it, but because she has forgotten the sequence of physical actions necessary to make it happen. I hope that the muscle memory will come back, but in the meantime it is a worry for all of us. Meantime, Dad has been ringing me up more or less every night in the wee small hours, asking me where Mum is, where the carers are, when the cab is coming to take him to hospital. At least now that Mum is home I might get a little bit of a break from all that, though it’s possible that all that will happen is that the questions will change. The situation is evolving faster than we can respond. I am up and down to Dorset visiting nursing homes ‘just in case’. It is very hard to find somewhere where Mum and Dad can be together with their different needs, but I shall keep trying. As much as anything else, I want to be prepared for the next emergency. So far in the last few months they’ve spent 9 weeks apart because one or the other has been in hospital. At least in a nursing home they wouldn’t have such frequent admissions, and would be released more quickly. In short I am at my tether’s end, and beyond. However, outside my rapidly shrinking world of care rotas and supermarket orders and medical appointments, the world goes on.Between 17.30 and 18.30 on a fine day in October, the light has a quality that is unlike that at any other time. Photographers call it ‘the golden hour’, that short window when the sun’s rays are low and diffuse, and everything is lit up as if from within. 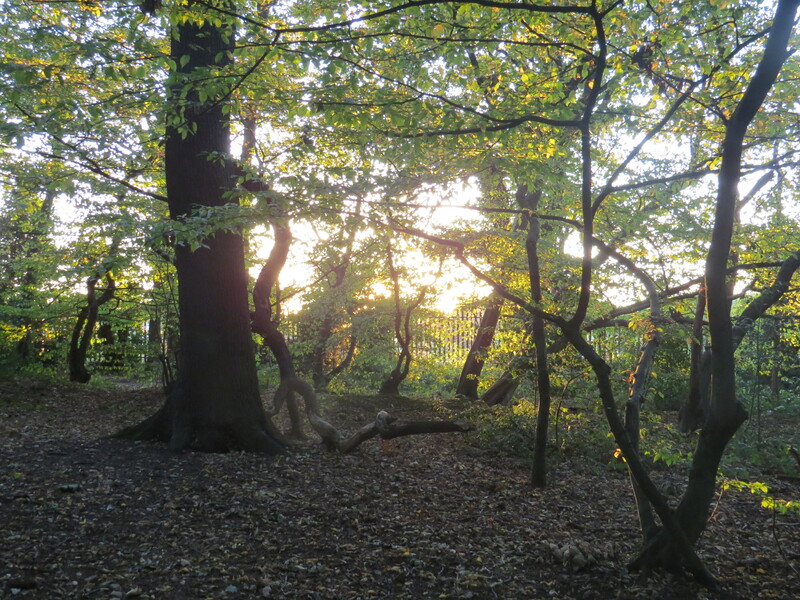 On Wednesday my husband came home early, and more or less dragged me out of the door, onto the County Roads in East Finchley and down to Coldfall Wood. 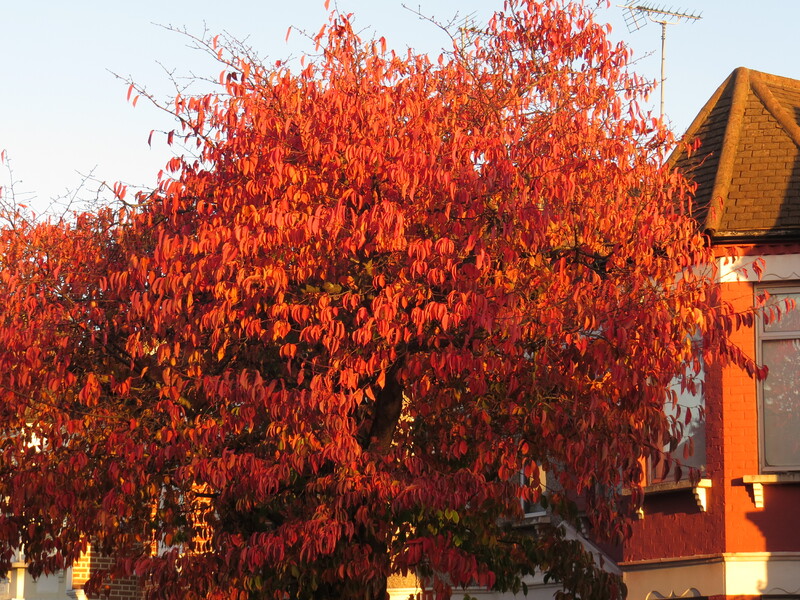 I hadn’t noticed that the trees had started to redden, but it must have been going on for ages. And look at the berries! 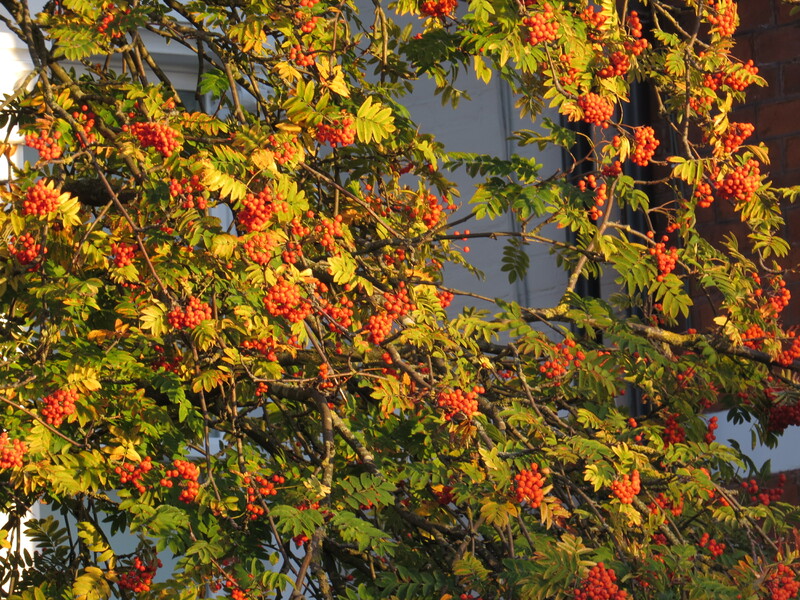 My heart lifts at the thought of redwings and waxwings and blackbirds having something sweet(ish) and natural to fatten them before winter comes. I hear the chuckle of jackdaws overhead, and it puts me in mind of Dorset, where they are commonplace. Here in North London, a pair moved in a few years ago, and this year I was visited by a family of five. 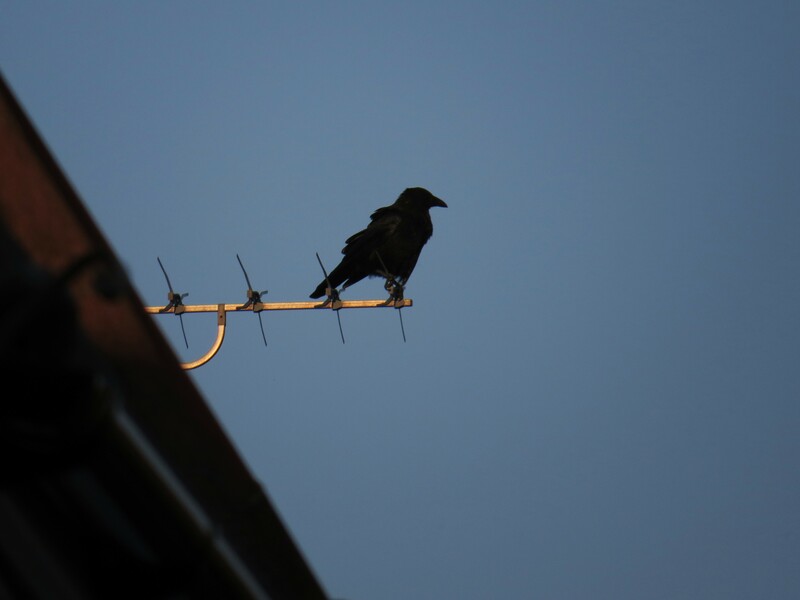 The crows are still more commonplace though, perched on the television aerials and surveying the scene for a feeding opportunity. And then into the woods. By the main entrance the colours are subdued and muted, shadowy and understated, but as we walk west, everything is touched with the setting sun. 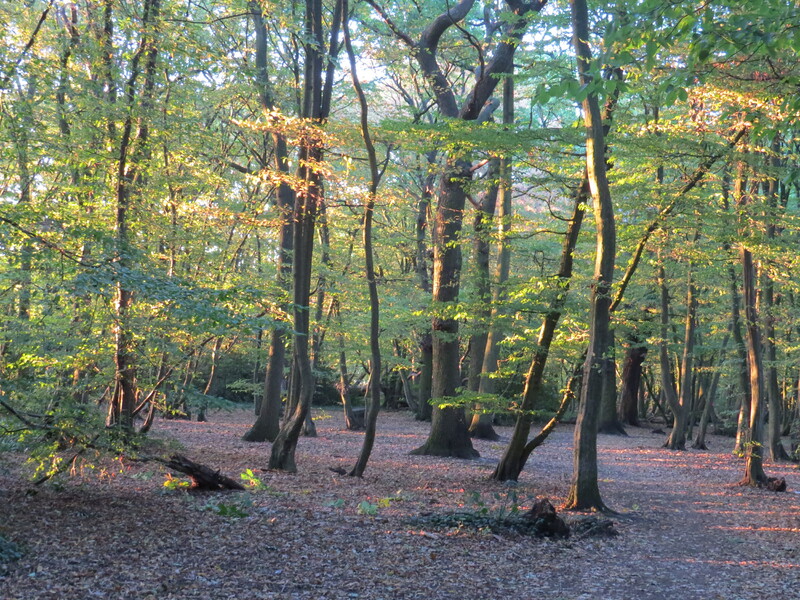 The leaves of the twisted hornbeams catch the last rays and shimmer. 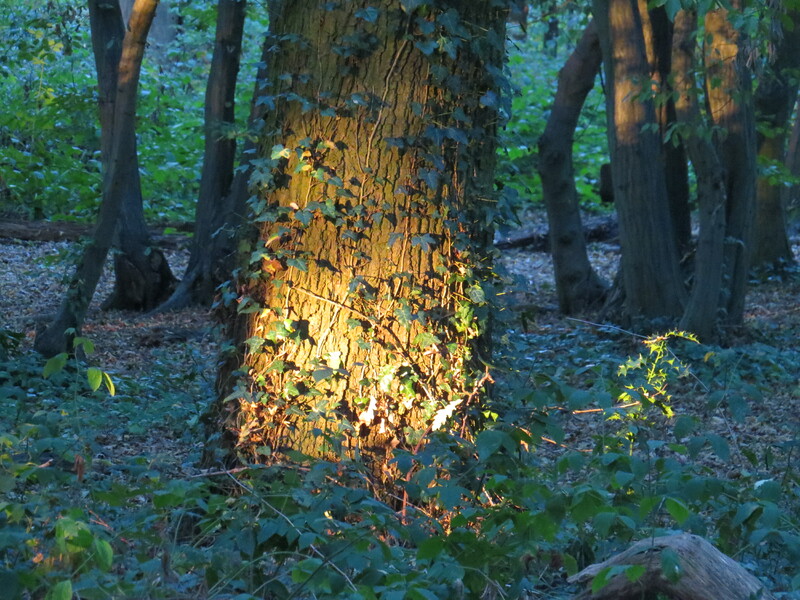 The sun hits some trees like a searchlight, illuminating every detail of bark, revealing the corrugations, the crisscross stems of ivy, the spikes of holly. 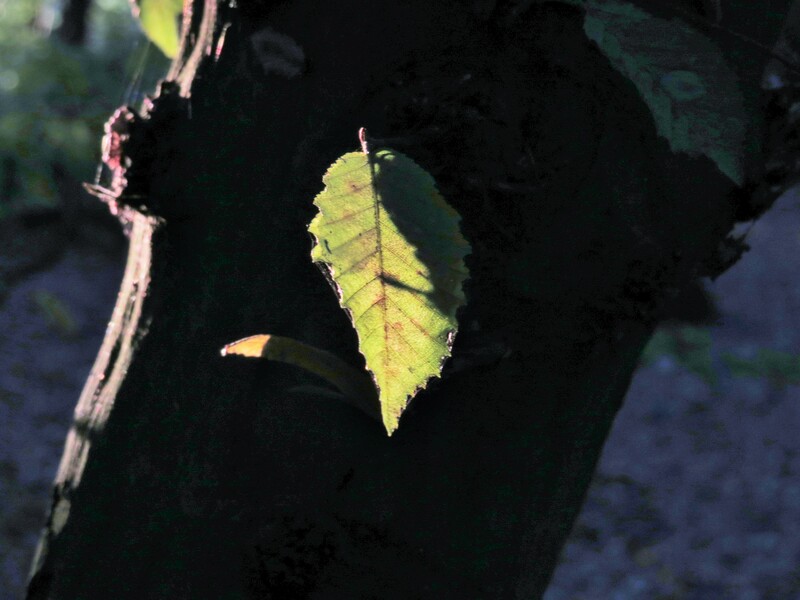 A single leaf dangles from a strand of spider silk, and is transformed. And when I look back, I see that the sun has painted a long pathway into the woods that seems to open for a few short moments before the sun sinks too low, and it’s gone. I have been so busy, moving quickly because I think that I can outrun what’s coming for me, and for Mum and Dad. The last thing I want to do is meander through the trees and let myself be caught. But here in the woods there’s the sense of life proceeding on a scale that is far greater and older than our human span. The sun goes down whether I want it to or not, and sometimes all there is to do is to drink in both the poignancy and the beauty of that moment. This entry was posted in London Birds, London Places, London Plants on October 6, 2018 by Bug Woman. Such a difficult time for you, it was worrying enough to try to deal with one parent at a time but both poorly at the same time must be so hard. One thing’s for sure you never lose your ability with words and the photos were absolutely beautiful. We hope it gives you as much pleasure writing your post as it does us reading it. Take care. Thanks, Fran and Bobby. Writing the blog is one way to keep sane, for sure! Thanks Mike, and yes, the leaves did look purple, very strange! I’m so glad hubby made you take a moment away from the claustrophobia of caring for your vulnerable and much loved parents. Being a loving and dutiful daughter can be so totally draining there is nothing left of ourselves. And your situation sounds like such a nightmare. Thank you for sharing the beauty of your little breathing space yesterday. The photos are lovely and there is such a poignant serenity to them. Wishing you all speed finding a safe haven for Mum and Dad, and peace for yourself. So beautiful. I feel very much for you. Thank you Gert. Taking things one day at a time at the moment…. Hugs, a good reminder of letting nature nurture us! I am still thinking of you. That is all I can say, for which I apologise. I was redirected here by C at Sun Dried Sparrows – Having read your story above, I seem to be having a similar experience at the moment, trying to care for my mum. That must be tough though having both mum and dad to look after. Like you I find a bit of solace in writing about it all (My blog is called “What’s It All About?”, on C’s sidebar). I try to keep the personal stuff out of my blog but every now and again it all pours out, as happened this week. The lovely comments of support however mean it was the right decision to do so. Hope all goes well for you, and them. I love your photos by the way. Autumn I think is the best season for heading out and capturing those great colours. Thank you, Alyson – yep, we’re not alone, almost everyone I talk to is either going through this with their parents, or has been through it. It’s very tough. Look after yourself is my advice (though I’m not always very good at doing it myself 🙂 ). I will pop over and have a look at your blog, and I’m glad you like the photos. I wouldn’t worry too much about including the personal in your blog posts. It’s what turns what could be a ‘dry’ post on a subject into something more interesting. Plus, as you’ve found out, people can be so supportive. Being open and vulnerable can be a way of building community too, online or in ‘real life’. Yes I have many friends going through the same thing – Just another stage in life isn’t it but wasn’t prepared for it. I may update my blog later today but this was my last post which is quite relevant to our situations. I usually blog about music (tenuously at times) but also love taking photos of our countryside and often include them – The colours right now are fabulous so must take some later on today. Thanks for the reply – I does help to have this fairly anonymous community who are all very supportive. So sorry to hear about Mum and Dad’s issues.I do hope you find somewhere suitable for them soon. The photos are so beautiful, thank you. So sorry to hear about the ongoing problems your parents are having Vivienne – but I am glad you can take a little time out to appreciate the world around you. 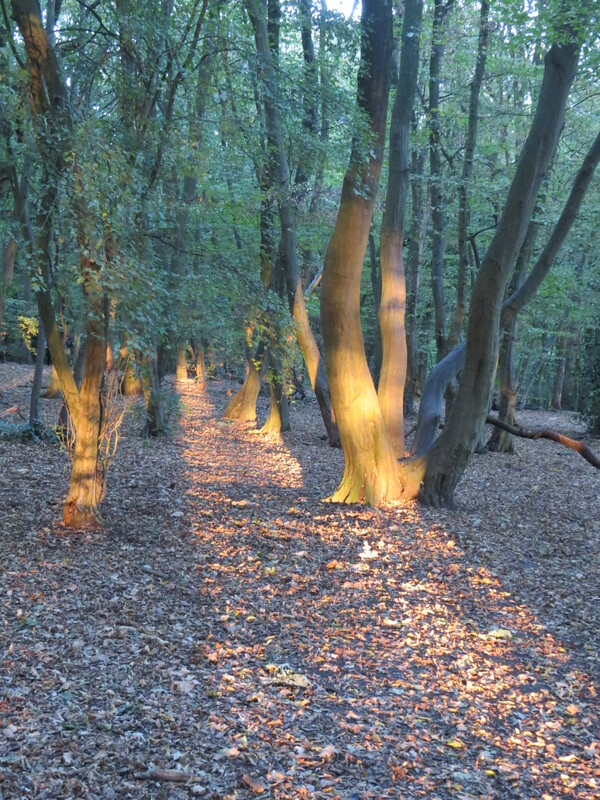 The photos are beautiful, particularly that magical path through the woods.